Frack Sand: Coming to a Railroad Near You? One thing you can be certain of if you're living next to a gas well: dust. Dust from trucks coming and going all hours of the day or night, dust from the drill rig, and dust from the frack job. While some of this is just plain old ground up soil, frack sand is special. It's not dirt, but instead tiny silica crystals - tiny sharp crystals just the right size for breathing in and lodging into the interior of worker's lungs. Not to mention the lungs of people living and breathing near drill sites. It can take up to four million pounds of frack sand to stimulate a single well. Sand that starts in Wisconsin and travels by rail to places like Binghamton, NY. From there the sand is loaded onto trucks and hauled, across the state border to drill pads in PA. Sand is spilled in the rail yard, blows out of truck hatches, and ends up in air that people - children, grandparents, mothers and fathers - breathe. These aren't workers who wear protective respiratory masks. They are... the "collateral damage" of environmental exposure. Photo-journalist Vera Scroggins recently took a field trip to the Binghamton, NY rail yard to watch how frack sand is handled there. Her assessment: not too carefully. As the trucker said, "we wear the masks on the drill pad." 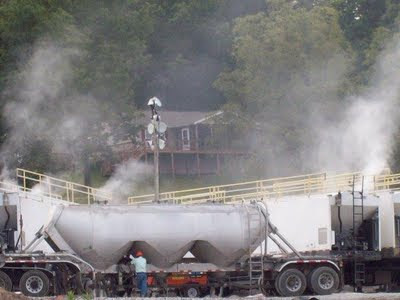 Eric Essweing, a workplace safety expert who conducts research with the National Institute for Occupational Safety and Health, found that workers in the fracking industry are at risk because of their exposure to silica dusts. Last year he and his colleagues visited 11 sites in five states: Arkansas, Colorado, Texas, North Dakota, and Pennsylvania. At every site they found high levels of silica in the air - so high that the respirators workers wore did not protect them from this excessive exposure. In fact, 79 percent of the air samples they collected had silica levels that exceeded NIOSH and OSHA recommended levels. Thirty percent of the samples had silica levels 10 times higher than the recommended level, and one was measured at more than 100 times the recommended limit. Those levels are set for workers - using the average adult male to calculate health impacts. There are NO recommended exposure levels for children and others who wouldn't normally be in such an environment. OSHA and NIOSH published a "Hazard Alert" - a great resource for workers who can demand respirators and pressure their employers to institute steps to reduce frack sand exposure. But it does nothing to address windblown frack sand in Binghamton and other cities and towns. Nor does it address exposure to citizens who become unwitting casualties of the rush to frack wells. Last week the Tompkins County Worker's Center issued a statement warning people seeking employment in gasland of some workplace hazards on the well pad. "While jobs in fracking may offer high pay, they come at a price," says the Center. "A worker may get a job — and never be able to work again. Workers are often the first to be exposed to the hazards that later affect the whole community." Their message: Think Twice. (PHILADELPHIA – May 22, 2013) U.S. Environmental Protection Agency today announced a Clean Water Act settlement with Fluid Recovery Services, LLC (FRS), which operates three wastewater treatment plants in western Pennsylvania. The settlement resolves discharge permit violations associated with the treatment of wastewater generated from oil and gas extraction activities. Under the settlement, FRS must seek renewal of their Clean Water Act discharge permits from Pennsylvania Department of Environmental Protection (PADEP) and request that PADEP include the more stringent discharge limits in Pennsylvania’s wastewater treatment standards. This includes a new standard of 500 milligrams per liter for total dissolved solids in their renewed permits. In addition, the company will pay an $83,000 penalty for violations that occurred at facilities located in Franklin, Creekside, and Josephine, Pa.
FRS will invest as much as $30 million to upgrade the facilities to comply with the new more stringent discharge limits. Meeting the more stringent discharge limits will enable the facilities to be eligible to treat wastewater from unconventional oil and gas extraction activities, such as hydrofracking. The agreement prohibits FRS from discharging wastewater from hydrofracking or other unconventional oil and gas extraction activities until after the facilities have achieved full compliance with the more stringent discharge permit limits. The facilities, which discharge to the Allegheny River watershed, have not been discharging such wastewater since September 2011 following the issuance of an order to each facility by EPA and a request from PADEP in April of 2011 that asked oil and gas producers not to send their wastewater to treatment facilities that could not meet the more stringent discharge limits. The former operators of the facilities, Hart Resources Technology, Inc. (Hart) and Pennsylvania Brine Treatment, Inc. (PBT), recently merged to form FRS. As part of the proposed penalty settlements, Hart and PBT neither admitted nor denied responsibility for the violations. The shutdown of the Williams Central Compressor yesterday left us with the same wonderful sounds we had taken for granted for years: the sound of chirping birds, dueling bullfrogs, the sound of a gentle breeze. We decided we should savor sitting on our front porch last night, which used to be a relaxing way to recharge on a lovely summer evening.....there was no constant traffic associated with the expansion project of the compressor about a mile up the road from our home. We used to walk up to the Newton Hill Cemetery, a leisurely walk on our country road. Our road has turned into an industrial highway with as many as 2000 vehicles a day as documented by video. We wanted to retrace our memories and do those things we have not done in over a year since the compressor and well pad were installed off our road. We decided not to walk as there are so many transient workers in our area for the pipeline, compressor, well pad. So we drove, and parked along our neighbor’s cornfield, and sat in the field looking at the beautiful starry sky down the valley. The view from their tilled field has always been a favorite; you feel you are on top of the world looking out over the distant mountain ridges and down our valley. We have permission from our neighbor to walk in their field; they also use a 30 acre field of ours for crops. The view has changed as there is a Cabot well pad waiting to be completed on the adjoining field belonging to a different neighbor. We sat in the field, enjoying the starry sky, savoring the respite from traffic and noise 24/7, savoring the sounds of a beautiful country evening. We saw a truck drive up to our parked car. It slowed down to pass it, to turn around and slowly go back down the hill. It was Cabot security. We decided we would leave, as we suddenly felt scared. We drove up Turnpike Rd past the Williams Central Station, and could hear it was back up and running to some degree. We turned right onto Puzo Rd, and suddenly there were two cars behind us following closely. We turned left onto Caitlin, then right onto 167 South. We wanted to see if they were in fact following us before we went home. They did follow, one pick up passed up and then stopped in front of us, blocking us by parking the truck over the double solid yellow lines on the road. My daughter was scared, I was mad, she was driving. I told her to go around these vigilantes, but she rolled her window down as a man came to her driver door. He accused us of trespassing and drinking. I told him he had no right to stop us in the middle of a road, that he was a thug and that we were not trespassing. He insisted we were on Cabot property, and I told him he was dead wrong, we were not on the well pad property; we were on our neighbor’s field with permission. He said he had called the police as we were trespassing and drinking, neither of which we were doing. I was irate and he refused to tell me his name, and said only that he was local. He had tattoos all over his arms and some scruffy facial hair. He was a slim build. He got back in his car and we were escorted back to our home with one thug behind us and one thug in front of us. I was furious, alarmed and shocked, but we did go home. We sat on our porch, feeling unsettled, angry, saddened, confused as to how drastically living on our hill has changed as so many transient employees subcontracted by industry now travel our road. Three nights ago we stopped to find help to get two of our neighbors cows back into a field they had escaped, two nights ago there was the fire at the Williams Central Compressor, and last night we were followed and stopped on the road by two security vigilantes: subcontracted by Cabot to guard their well pad about 1500 feet from our home. Half an hour passed, two white pickups went back and forth in front of our house. About 5 minutes later a PA State Trooper car pulled up, and turned into my driveway. He bottomed out as the road is now too high for the driveway since industry built it up to accommodate their heavy traffic. Trooper Bowman said Cabot Security had called them to come make sure we were "OK". I was furious, and recounted our evening sitting in our neighbor’s field, how the two thugs followed us and stopped us by blocking us on a state road, Route 167. The Trooper listened politely, and said he would go get the other half of the story. I was in disbelief at having a Cabot Rent a Cop call the cops to come to my home after their outrageous behavior. I want a copy of the Trooper's report. This morning I spoke with a Sargent from the Gibson State Police Barracks. He did indicate the roadblock was not appropriate and he would follow up with Cabot. He also indicated the level of suspicion is high as the cause of the Williams Central Compressor fire is still under investigation and is undetermined at this time. 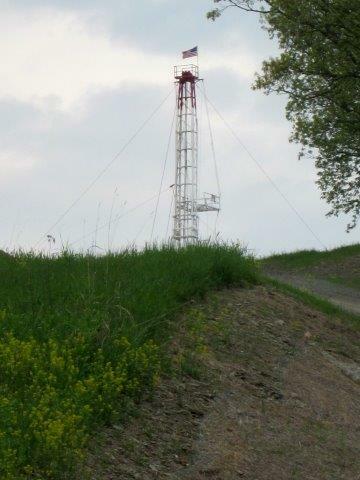 Back in October, Owego residents living near McHenry Road were surprised to see a well rig in their neighborhood. The well was drilled, the rig and truck traffic disappeared, and that was the end of it - or so people thought. By late October, Carrizo had their exploratory data and were preparing to plug the well. That's when they noticed some bubbling. Gas was leaking between two of the casings. This new information comes from a pair of DEC inspection reports obtained through a Freedom of Information request submitted by an Owego resident. It makes for interesting reading. On Oct 25 the DEC inspector notes that gas was leaking at a rate of 15-20 cubic feet a day. The well operator, Carrizo was concerned about Hurricane Sandy and proposed monitoring the gas leak. A couple weeks later, on November 13, Al Owings of Carrizo calls DEC and asks whether they can abandon the well with a vent pipe. Notes from DEC investigator: "I told him that I did not know and that NY has no specific regulatory guidelines about the matter." 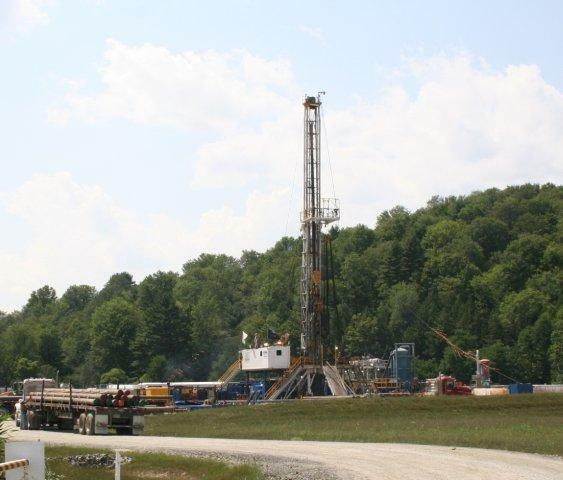 Now there's a rig back on the pad, and it appears that Carrizo is going to plug the well - the first real "Marcellus" well in Tioga County. Granted, it was a vertical well and drilled primarily to extract data, not gas. Vertical wells, while allowed under current permits, are not the most efficient way to exploit shale gas - but they serve well for exploring the new formations. The Wetterling well was drilled to 4745 feet, not as deep as some of the wells around the area (some go deep into the Trenton Black River formation around 10,000 or so feet below the surface). There was no horizontal drilling, no hydrofracking. And yet it still sprung a leak. 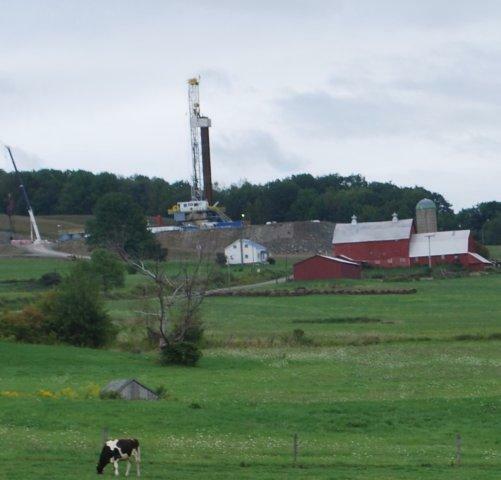 Methane leaks are not unusual for shale gas wells in Pennsylvania. 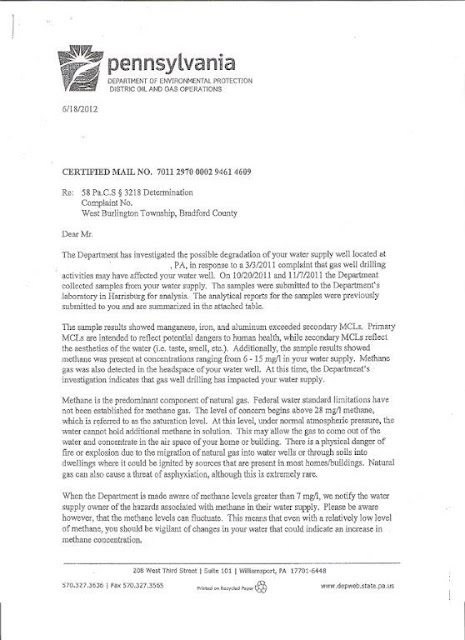 In fact, citizen reporter Vera Scroggins recently compiled a stack of "Letters of Determination" from PA's Department of Environmental Protection advising homeowners that they have methane - and other contaminants - in their water wells, and that gas drilling activities in the area may have affected their water supply. 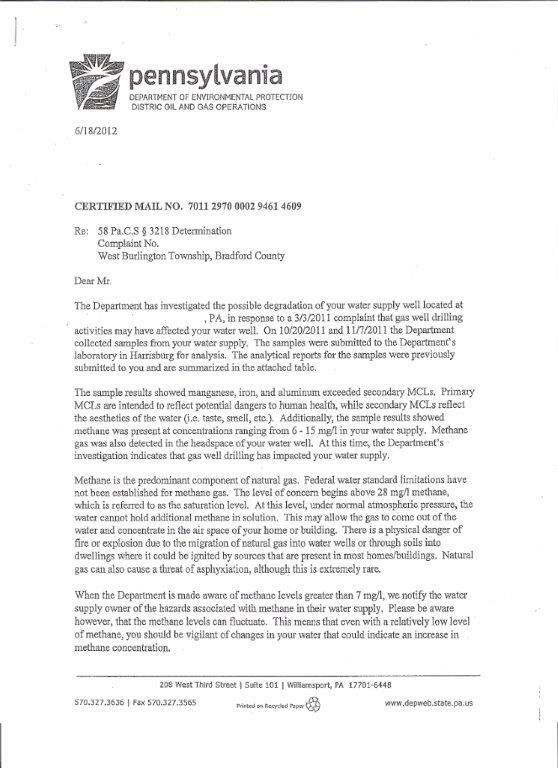 This is not the kind of letter anyone living near a well wants to receive - whether they live in Bradford County, PA or Owego, NY. Tom Wilber has posted more about this on his excellent blog, Shale Gas Review. NY towns can ban hydro-fracking and shale gas drilling within their municipal borders – that’s the decision handed down from the state Appellate Division today. Pro-drilling landowners in the towns of Dryden (Tompkins County) and Middlefield (Otsego County) had sued the towns in an attempt to get drilling bans overturned. When they lost their suit in the lower court (the state Supreme Court) they appealed. Today’s decision, from the Appellate Division, Third Judicial Department upholds last year’s decision and clarifies that, although NY environmental law gives all regulatory oversight of drilling to the state, it does not curtail a town’s ability to use land-use laws to protect the town’s interests. They upheld that same decision for the Middlefield case.